Networked and DVR-connected video cameras targeted for home use have been available for years, but what has been missing from the market is an easy-to-setup and easy-to-use Wi-Fi video camera and associated services. 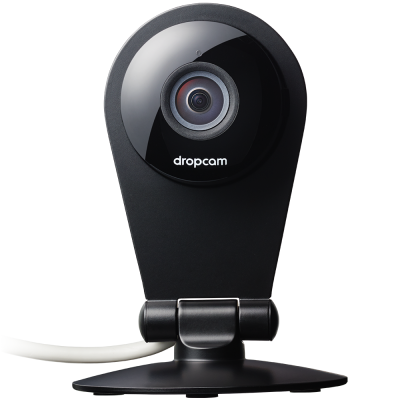 Dropcam has filled the void with its line of feature-packed Wi-Fi video cameras and services, designed to be used for home security and home monitor purposes. Sounds good so far. Let’s take a look at the main advertised features of Dropcam, with my commentary added below each one. • Watch your video via iOS, Android and web apps anytime, anywhere. Access to your video stream from anywhere, at any time. That’s always been the true promise of a networked video camera. Dropcam’s integration with the Apple iOS and Google Android platforms really delivers on that anywhere, anytime access wish. Viewing your home video stream from a smartphone while you are away is the ultimate feature in home monitoring convenience. Other products require complicated and difficult firmware updating procedures, so it’s nice to see that Dropcam provides automatic updating services for its hardware. • Get new features with camera, cloud and app updates. In 3 words: Continued Product Development. Dropcam actually improves their software and services, making your experience even better as time goes on, as new releases are made available. Dropcam can detect where you are and can turn your camera on and off based on that knowledge. Granular controls like these make Dropcam very powerful and expand the possibilities for its use. Control the times at which Dropcam is on, based on times, days or specific week. The more control, the better for this type of product. You can invite specific people to view your Dropcam video stream, or make it publicly accessible for all to see. Do you need to make sure that video feed is recorded and stored in a safe location? If so, then it’s cloud recording to the rescue. Archive that video footage online, without having to worry about local hard drives or storage. • Review footage from the past week or month. Save and share favorite clips. More bonuses included with the Dropcam software. I could see all of these features being very useful and heavily used by Dropcam customers. My ideal Dropcam setup would include at least 2 Dropcams; one for my front door and one for the rear door on my house. While I’m at home, the Dropcam installed near my front door would be a great tool for determining who had come calling, as I do not have a peep hole integrated into my front door. If I didn’t want to open the door for the person at the door, I could use Dropcam’s two-way talk feature to have a conversation with the visitor from the safety of inside my home. At night, I could use Dropcam’s integrated night vision to see what was occurring at the front and rear of my house. If a small detail within your video needs further investigation, Dropcam Pro’s 8x zoom feature can help you investigate further. While we are away from home, whether that be a vacation, a day trip or a dinner outing, I would highly rely on Dropcam’s Intelligent Alerts. I would want an email or MMS picture message sent to me any time there was motion detected on my Dropcam video streams. These type of notifications could help my home feel secure while it was vacant. Of course, I’m sure that I would also use my Android device to tap into the full, live video stream on occasion while I was away from home, which is supported via Dropcam’s cloud streaming feature. With all of these great features and with Dropcam’s emphasis on ease of use, I am very interested in trying out Dropcam and potentially using them for all of my home video monitoring needs. Numerous competing products on the market are just plain difficult to use and configure, so it’s a breath of fresh air to see a company that makes this type of setup a breeze. Dropcam has real promise and some powerful features, and due to that, I’m looking forward to testing them out in the future. Dropcam was acquired by Nest, and has been rebranded as Nest Cam.